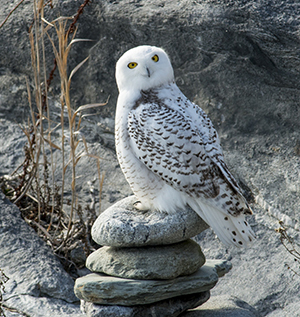 It’s not that uncommon to see one or two snowy owls during the winter here in southern New England — perhaps young birds pushed far afield of their native arctic tundra by older and more experienced owls. This year, however, the entire Northeast seems to be experiencing a significant influx of these large raptors. Among other locations in Rhode Island, these majestic creatures have been spotted at Sachuest National Wildlife Refuge in Middletown, Moonstone Beach in South Kingstown, on the Charlestown Breachway, on the Jamestown Bridge, and on beaches in Barrington and Block Island. Snowy owls are native to the far north areas of the Arctic Circle and can be found circumpolar — in Canada, Greenland, Russia and northern Europe. They are extremely diurnal birds and will often hunt around the clock in the 24-hour daylight of Arctic summers. Being above the tree line, they live and nest on the frozen ground — kept warm by their thick plumage and heavily feathered snowshoe-like feet. Their own populations rise, fall and disperse depending on the highly variable “boom and bust” cycles of their primary prey: lemmings and voles. They will also feed on weasels, squirrels, ptarmigan, hares, rabbits, ducks and other waterfowl. Unlike many owls, they are agile hunters and have a lot of skill in flight — often taking birds right out of the air. The Audubon Society offers some guidelines that one can follow if you are interested in viewing these birds without causing undue stress. Get out your binoculars and bring spotting scopes. If there are other birders at the site, they might be willing to share their binoculars for a few minutes. Don’t try to creep closer and closer to see them with the naked eye. Be content to view at a distance. Give them a distance of 200-300 feet or more. This is not a bird you should be sneaking up on with your camera phone. Photographers should use long lenses and tripods. If there is a group of people, try to stay as a group. Don’t encircle the owl. Give them at least a 180-degree escape route. Don’t observe them for an overly long period of time.